This family line is special. It was the first family tree that I recorded as a child of 10 years old. My grandmother, Margaret Amelia HOENER, posessed a copy of a family tree, done by her brother, Albert HOENER. The information was gathered by his cousin, Hilda OELGARTH, and her daugher, Helga ZUNDT/ZUENDT, on a 1950s trip to Germany. I desperately wanted a copy, however, I didn't dare ask for my grandmother's, so, I hand copied the information and saved it, over the years, recopying it several times, until the computer age arrived. Until now, I thought no copies survived. Recently Patrick HOENER found one in his father's papers and passed them to his sister, Mary Jo. Thanks to them, the Hoener Family History is no longer lost. Way to go, guys! After 40 years, I now have my own copy. Do you believe in miracles? Yes! Our new 'honorary cousin' Wolfgang Aretz, of Cologne, Germany, is a living miracle! We can never repay our debt for his tireless and generous efforts to 'reunite' us with our von Zuccalmaglio ancestors. He will remain a legend in our family forever! in Germany. Copyright belongs to Clemens und Simone von Zuccalmaglio (www.zuccalmaglio.de). We owe a special thanks to the incredible generousity of Wolfgang Aretz of Cologne, Germany. Though he has no relationship to our von Zuccalmaglio line, he has taken the time to send an incredible amount of information, from his own research, which has given us the names of seven additional children of Frederico Heinrico von Zuccalmaglio and Eleonora Rappold, AND their parents. Since then, he has sent eight more generations taking us back to the 1400s, along with many wonderful pictures, information and names of other von Zuccalmaglio researchers that we would otherwise have never found. His ongoing efforts include telephone calls, meetings and searches in Archives in an effort to obtain copies of the original church transcriptions that hold the records of the family births, deaths and marriages. His kindness is overwhelming and will always be remembered. I'm sure Wolfgang would appreciate hearing just how much we all appreciate having him as an "honorary cousin" and a sincere thanks for all of his unselfish efforts on our behalf. by Natascha Constantin, Bochum, Germany. 1. Clemente1 de Zuccalmaglio was born Abt. 1470 in Italy. He married Unknown. i. Gio Francesco2 de Zuccalmaglio, b. 1503, Italy. 2. ii. Tommaso de Zuccalmaglio, b. Italy. iii. Bortolamio de Zuccalmaglio, b. 1493, Italy. 2. Tommaso2 de Zuccalmaglio (Clemente1) was born in Italy. He married Unknown. i. Lucia3 de Zuccalmaglio, b. Italy. 3. ii. Bernardino de Zuccalmaglio, b. Italy. iii. Pietro de Zuccalmaglio, b. Italy. 3. Bernardino3 de Zuccalmaglio (Tommaso2, Clemente1) was born in Italy. He married Unknown. 4. i. Bortolamio4 de Zuccalmaglio, b. Italy. 4. Bortolamio4 de Zuccalmaglio (Bernardino3, Tommaso2, Clemente1) was born in Italy. He married Unknown. i. Niccolo5 de Zuccalmaglio, b. Italy. ii. Bernardino de Zuccalmaglio, b. Italy. 5. iii. Giovanni de Zuccalmaglio, b. Italy. 5. Giovanni5 de Zuccalmaglio (Bortolamio4, Bernardino3, Tommaso2, Clemente1) was born in Italy. He married Unknown. i. Bortolamio Nod6 de Zuccalmaglio, b. Italy. 6. ii. Giacomo de Zuccalmaglio, b. 1664, Italy. 6. Giacomo6 de Zuccalmaglio (Giovanni5, Bortolamio4, Bernardino3, Tommaso2, Clemente1) was born 1664 in Italy. He married Unknown. i. Bortol7 de Zuccalmaglio, b. Italy. ii. Niccolo de Zuccalmaglio, b. Italy. iii. Ant de Zuccalmaglio, b. Italy. 7. iv. Angelo de Zuccalmaglio, b. Italy. v. Giulia de Zuccalmaglio, b. Italy. 7. Angelo7 de Zuccalmaglio (Giacomo6, Giovanni5, Bortolamio4, Bernardino3, Tommaso2, Clemente1) was born in Italy. He married Unknown. 8. i. Antonio8 de Zuccalmaglio, b. Italy. 8. Antonio8 de Zuccalmaglio (Angelo7, Giacomo6, Giovanni5, Bortolamio4, Bernardino3, Tommaso2, Clemente1) was born in Italy. He married Unknown. 9. i. Angelo9 de Zuccalmaglio, b. Italy. 9. Angelo9 de Zuccalmaglio (Antonio8, Angelo7, Giacomo6, Giovanni5, Bortolamio4, Bernardino3, Tommaso2, Clemente1) was born in Italy. He married Unknown. 10. i. Antonio Simeon10 von Zuccalmaglio, b. Jul 27, 1712, Caprino Veronese a short history, Lombardia, Italy; d. Bef. 1793, Heinsberg, Preussen, Germany. 10. Antonio Simeon10 von Zuccalmaglio (Angelo9 de Zuccalmaglio, Antonio8, Angelo7, Giacomo6, Giovanni5, Bortolamio4, Bernardino3, Tommaso2, Clemente1) was born Jul 27, 1712 Baptism Record) in Caprino Veronese(Verona? ), Italy Palace Zuccalmaglio and died Bef. 1793 in Heinsberg, Preussen, Germany. "Zucca al Maglio" was once translated to mean pumpkin on the stem. The family tree goes back to the fourteenth century. 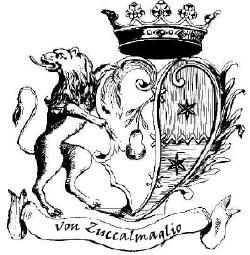 Anton von Zuccalmaglio was said to be the son of a wealthy old Italian family. This may have been fabricated by Anton as Germany and Italy both rejected this claim. The Hoener family history reported that "he lost his parents early, left his native country and became a page on the electoral residence at Bonn, Germany and later at the electoral residence at D�sseldorf, Germany where he was favored by the Electress, Maria Anna Josepha, the half sister of the Emperor Leopold I, a distant relative of him." This may not be true. From "Heinrich von Zuccalmaglio and the Bergische Sicherheitskorps" by Fritz Hinrichs: Antonio was an officer in the "Kurpf�lzischen Graf Eliotischen Regiment zu Pferde". On October 29, 1738 he received a patent as a Cornet. When his son, Henrico/Heinrich, was born in 1743, Antonio was listed in the Baptism Record as a Banner carrier in the kurpfaelzischen mounted regiment of the Count von Thurn and Taxis, in the Kompagnie of the Major von Francken. He served as a soldier in the cities of Siegburg, Heinsberg, D�sseldorf and Honnef. As a "Rittmeister" he fought as an Austrian soldier in the "Seven Years War" and led a group of forty-two men, assigned to 1760 the Pfalz Kurassieren. Antonio Simeon von Zuccalmaglio married Maria Barbara Barbaree before 1739. She was born 1710, and died Mar 29, 1793. As yet we know nothing of her ancestry. It is said the "widow of a Captain von Zuccalmaglio died March 29, 1793, leaving behind a son, a Captain in Mannheim, named Phillip of Zuccalmaglio. The estate was greatly reduced during their old age and "long patient stocks; a farm servant inherited clothes and bedding." iii. Matthias Joseph Ludovicus von Zuccalmaglio, b. Mar 19, 1741, Heinsberg, Nordrhein-Westfalen, Germany. v. Gustav Philipp von Zuccalmaglio, b. 1744, probably Heidelberg, Germany; d. 1745, D�sseldorf-Hamm, Germany. vi. Henricus Franziscus Godefridus von Zuccalmaglio, b. Jan 19, 1745, D�sseldorf-Hamm, Germany; d. probably Lucca, Italy. vii. Anton Benedikt von Zuccalmaglio, b. 1750, Hilden, Nordrhein-Westfalen, Germany. viii. Wilhelm Joseph von Zuccalmaglio, b. Oct 25, 1752, Honnef, Nordrhein-Westfalen, Germany. ix. Lorent/Laurenz von Zuccalmaglio, b. Abt. 1754, Unsure; d. Abt. 1765, Unsure. 11. Marian Henricus/Heinrich11 Ferdinand von Zuccalmaglio (Antonio Simeon10, Angelo9 de Zuccalmaglio, Antonio8, Angelo7, Giacomo6, Giovanni5, Bortolamio4, Bernardino3, Tommaso2, Clemente1) was born Mar 08, 1743 Baptism Record in D�sseldorf-Hamm, Nordrhein-Westfalen, Germany, and died Apr 19, 1829 in M�lheim am Rhein, Germany. He married Maria Catharine Eleonora Florentine Rappold Aug 24, 1773 in D�sseldorf-Hamm, Rheinland, Germany, daughter of Johann Laurentius Rappold and Maria Elisabeth Olligschlager. She was born Feb 10, 1755 Baptism Record in D�sseldorf, Rheinland, Germany, and died Apr 23, 1835 in M�lheim am Rhein, Germany. Death Record. Child of Johann Laurentis Rappold and Maria Barbara Ofner: Godparents to their children. viii. Maria Catharine Eleonora Florentine Rappold, b. abt. Feb. 10, 1755 m. Marian Henricus Ferdinand von Zuccalmaglio (see #11 above). Marian Heinrich/Henrico Ferdinand von Zuccalmaglio became a soldier of the Kurpfalz when he was just 13 years old. On February 9, 1760, he became a "Cornet beim L�blichen Reiterregiment". He got money, bread and forage, 29 Gulden, 18 Kreuzer and 4 4/5 Pfennige per month. 1760 he fought in Gro�mannsdorf, Dresden, Buckerswald, Mertzkirchen, Strehlen, Halle, Plauen und Ottowin. He became a lieutenant on December 28, 1775 at "Prinz Maxischen Reiterregiment". Pfalzgraf Carl August von Zweibr�cken was the Chief. On August 24, 1773, at 30 years old, Heinrich/Henrico married Maria Catharina Eleonora Florentine Rappolt/Rappold. She was the daughter of Johann Laurentis Rappold (Rappoldt/Rappolt) a medical doctor and the Mayor of D�sseldorf and his 2nd wife, Maria Elisabeth Olligschl�ger. Their first child, Barbara Catharina Johanna von Zuccalmaglio, was born on May 5, 1774. The Godparents were Maria Barbara von Zuccalmaglio(probably Heinrich's mother) and Laurentius Rappolt(Eleonora's father) and Catharina (Olligschl�ger) Cluth, daughter of Eleonora's probable uncle and wife, Joannes Gerardus and Gertrudis Catharina (Zum Dern) Olligschl�ger. Henrico lived about nine years in D�sseldorf. During this time Eleonore was a shopkeeper (Kr�mer), selling things of daily requirement, such as tobacco and so on. It was according to rank at that time. On September 30, 1782, Heinrich was based in the "bergische J�gercorps". Their military barracks was in the "Buchheimer Stra�e" in M�lheim am Rhein, a place which belonged Hofrat Bertoldi. (At least four of Henrich's children's Godparents were Bertoldis.) The house of the "Commander of the bergischen Sicherheitskorps", which Johann Heinrich von Zuccalmaglio built after 1784, in M�lheim am Rhein, was in the "Br�ckenstra�e" on the place, where before was the house nr. 9/11 "Zur kalten Scheuer", which was destroyed by the great ice flood. He had to pay 4500 Reichstaler, the house was 43 feet long, 33 1/3 feet deep (ca. 13 x 10 meter), 3 floors, with cellar, a room for washing, a bakery-room, a pump, and entry behind the house. On April 15, 1793, Henrico became "Mayor of the Cavallery" during the time, he and his family lived in M�lheim am Rhein. In 1794 he and his soldiers were shifted to Wipperf�rth. He came back to M�lheim am Rhein in 1795 and on June 13, 1803, Henrico requested the position of Obristlietenant/Oberstleutnant, but was greatly dissappointed when his request was rejected on July 6, 1803. Henrico was a great friend of music, which was the reason for his friendship to Hofkammerrat Bertoldi. Bertoldi wrote a diary with many details about the Zuccalmaglio family: On November 30, 1803, Herzog Wilhelm von Bayern came from D�sseldorf to visit M�lheim am Rhein. Major von Zuccalmaglio and 16 Dragoners rode at his side. Later, Major von Zuccalmaglio rode to Deutz to accompany the Herzogin, who came from Munich. Bertoldi gave a great diner at midnight, and Henrico was invited too. On March 23, 1806, Joachim Murat, brother-in-law of Napoleon I. was Chief in Herzogtum Berg. Murat visited with Hofkammerrat Bertoldi on March 23, 1806 in K�ln/Cologne. At that time, Bertoldi recommended Henrico. On March 27, 1806, Henrico changed to the French and "swears in"(took the oath?) Murat, Napoleon and the great Nation(France). On May 1, 1808, Henrico became a Lieutenant Colonel of the 2. Eskadron (2nd and 4th Company). Henrico and Bertoldi were friends and while Henrico was absent from home, his wife daughters were invited to the Bertoldi home. On Christmas 1813, Henrico returned to M�lheim and his familiy, after the great Battle of Leipzig "V�lkerschlacht" and the defeat of Napoleon, and the victory of the Allies. In 1814 he assisted the soldiers of Russia, Prussia and Sweden to return to their homelands. Henrico died in M�lheim am Rhein at 86 years old on Apr 19, 1829. Death Record His will attests to the humble nature and rare simplicity of this highly respected man. Roughly translated, he writes: "One puts me in my uniform into the coffin made simply from fir wood. Eight men should carry my remains to the cemetery and get p.person 1 Reichstaler. The minister shall go along, with no one else. It will take place in the evening, in silence. Six torches/flares, carried by boys, will accompany the coffin. If one of the family wants to go along, in order to see where my remainders remain, then that remains released for it. The announcement of my death is to take place only by means of a ringing bell. Only a small funeral service is to be held the day after my funeral, whereby the altar will be lit with four torches only. Hereby the whole is decided." i. Barbara Catharina Johanna12 von Zuccalmaglio, b. May 05, 1774, D�sseldorf, Bilk, Rheinland, Germany; d. Oct 29, 1856, Grevenbroich, Nordrhein-Westfalen, Germany. 13. iv. Maximilian Friedrich August von Zuccalmaglio, b. Jul 18, 1779, Baptism Record D�sseldorf, Bilk, Rheinland, Germany; d. Dec 22, 1836, Death Record Siegburg, Nordrhein-Westfalen, Germany. 12. Salentinus Jacobus12 von Zuccalmaglio (Marian Henricus11, Antonio Simeon10, Angelo9 de Zuccalmaglio, Antonio8, Angelo7, Giacomo6, Giovanni5, Bortolamio4, Bernardino3, Tommaso2, Clemente1) was born Apr 24, 1775 Baptism Record in D�sseldorf, Bilk, Rheinland, Germany, and died Jan 02, 1838 in Barmen, Nordrhein-Westfalen, Germany. He married Klara Josepha Christina Von Deycks May 23, 1801 in Burg, Rheinland, Germany. Their House She was born Nov 19, 1770 in Burg, Rheinland, Germany, and died Feb 25, 1844 in Schlebusch, Rheinland, Germany. ii. Johann Heinrich von Zuccalmaglio, b. Feb 14, 1805, Schlebusch, Rheinland, Germany. 16. iii. Vinzenz Jakob (117kb) (17kb) von Zuccalmaglio, b. May 06, 1806, Schlebu, Nordrhein-Westfalen, Germany; d. Nov 21, 1876, Grevenbroich, Nordrhein-Westfalen, Germany. 17. iv. Klara Josepha Maria von Zuccalmaglio, b. Mar 20, 1808, Schlebusch, Rheinland, Germany; d. Dec 23, 1871, Lutzenkirchen, Nordrhein-Westfalen, Germany. v. Josephus Paschalis Jakobus von Zuccalmaglio, b. May 30, 1810, Schlebusch, Rheinland, Germany; d. Jan 27, 1839, Saarburg, Rheinland, Germany. vi. Hermann Heinrich von Zuccalmaglio, b. Apr 01, 1812, Schlebusch, Rheinland, Germany; d. Aug 07, 1819, Schlebusch, Rheinland, Germany. 13. Maximilian Friedrich August12 von Zuccalmaglio (Marian Henricus11, Antonio Simeon10, Angelo9 de Zuccalmaglio, Antonio8, Angelo7, Giacomo6, Giovanni5, Bortolamio4, Bernardino3, Tommaso2, Clemente1) was born Jul 18, 1779 Baptism Record in D�sseldorf, Bilk, Rheinland, Germany, and died Dec 22, 1836 Death Record in Siegburg, Nordrhein-Westfalen, Germany. He married Anna Henrietta Freymann Jul 18, 1827 in Siegburg, Rheinland, Germany Marriage Record (392kb), daughter of Johann Freymann and Anna Bleckmann. She was born Dec 10, 1806 in Mettmann, Rheinland, Germany, and may have died in the USA. 18. ii. Eleonora Johanna von Zuccalmaglio, b. Apr 26, 1830, Siegburg, Rheinland, Preussen; d. Abt. Mar 03, 1891, Beuel, Nordrhein-Westfalen, Germany. iii. Hermann Carl von Zuccalmaglio, b. April 19, 1833; Birth Record d. 1892; m. Augusta Kastens. iv. Johanna Marianna von Zuccalmaglio, b. Jun 18, 1835, Birth Record Siegburg, Rheinland, Preussen. 14. Ferdinand Joseph Maria12 von Zuccalmaglio (Marian Henricus11, Antonio Simeon10, Angelo9 de Zuccalmaglio, Antonio8, Angelo7, Giacomo6, Giovanni5, Bortolamio4, Bernardino3, Tommaso2, Clemente1) was born Abt. Jun 08, 1790 in M�lheim am Rhein, Germany, and died 1844 in Graach, Rheinland-Pfalz, Germany. He married Elise/Leonore Butte. She was born 1804 in Berstadt, Hessen, Germany, and died in Krefeld, Nordrhein-Westfalen, Germany. i. Clara Louise Henriette13 von Zuccalmaglio, b. Jun 21, 1824, Waldorf Coeln, Rheinland, Preussen. 19. ii. Friedrich Wilhelm Franz Joseph von Zuccalmaglio, b. Oct 05, 1829, Graach, Mosel, Rheinland-Pfalz, Germany; d. Dec 29, 1893, Mannheim, Baden-Wurttemberg, Germany. 15. Andreas Paschalis Franz12 von Zuccalmaglio (Marian Henricus11, Antonio Simeon10, Angelo9 de Zuccalmaglio, Antonio8, Angelo7, Giacomo6, Giovanni5, Bortolamio4, Bernardino3, Tommaso2, Clemente1) was born Abt. Mar 10, 1800 in St Clemens church, M�lheim am Rhein, Germany, and died 1873 in Mitau. He married Thekla von Beitler. She was born 1809, and died 1875.
i. daughter13 von Zuccalmaglio, m. Otto Muller. 16. Vinzenz Jakob13 von Zuccalmaglio (Salentinus Jacobus12, Marian Henricus11, Antonio Simeon10, Angelo9 de Zuccalmaglio, Antonio8, Angelo7, Giacomo6, Giovanni5, Bortolamio4, Bernardino3, Tommaso2, Clemente1) was born May 06, 1806 in Schlebu, Nordrhein-Westfalen, Germany, and died Nov 21, 1876 in Grevenbroich, Nordrhein-Westfalen, Germany. (He was also known as "Montanus") He married Gertrud Clementine De Caluwe Dec 22, 1835 in Bergisch-Gladbach, Rheinland, Preussen. She was born 1809 in Paffrath, Nordrhein-Westfalen, Germany, and died May 31, 1891 in Grevenbroich, Nordrhein-Wesfalen, Germany. i. Clara Wilhelmina14 von Zuccalmaglio, b. Apr 05, 1836, Bergisch-Gladbach, Rheinland, Germany; m. Friedrich Ewald Fomm, May 03, 1856, Huckeswagen, Nordrhein-Westfalen, Germany. ii. Helena Kunigunde Edmunda Maria von Zuccalmaglio, b. Nov 08, 1837, Blech, Nordrhein-Westfalen, Germany; m. Leopold Kamp, May 31, 1860, Grevenbroich, Nordrhein-Westfalen, Germany. iii. Hermann Theodor Wilhelm von Zuccalmaglio, b. Jun 30, 1841, Bergisch-Gladbach, Rheinland, Preussen; d. Jan 27, 1842, Blech, Nordrhein-Westfalen, Germany. iv. Alberta Gisella Catharina von Zuccalmaglio, b. Apr 23, 1843, Bergisch-Gladbach, Rheinland, Preussen; m. Gerhard Vasen. v. Hermine Gertrud Maria Petronell von Zuccalmaglio, b. Dec 19, 1847, Blech, Nordrhein-Westfalen, Germany; m. Dietrich Uhlhorn, Dec 28, 1871, Grevenbroich, Nordrhein-Westfalen, Germany; b. Dec 20, 1843, Grevenbroich, Nordrheim-Wesfalen, Germany. vi. Maria Henriette Anna Gertraud von Zuccalmaglio, b. Jul 25, 1851, Huckeswagen, Nordrhein-Westfalen, Germany; d. Jul 21, 1906, Bonn, Nordrhein-Westfalen, Germany; m. Hermann Hundhausen, Oct 05, 1876, Grevenbroich, Nordrhein-Westfalen, Germany. 17. Klara Josepha Maria13 von Zuccalmaglio (Salentinus Jacobus12 von Zuccalmaglio, Marian Henricus11, Antonio Simeon10, Angelo9 de Zuccalmaglio, Antonio8, Angelo7, Giacomo6, Giovanni5, Bortolamio4, Bernardino3, Tommaso2, Clemente1) was born Mar 20, 1808 in Schlebusch, Rheinland, Germany, and died Dec 23, 1871 in Lutzenkirchen, Nordrhein-Westfalen, Germany. She married Theodor Braun Oct 30, 1838 in Schlebusch, Nordrhein-Westfalen, Germany. He was born Nov 10, 1802 in Wiesdorf, Nordrhein-Westfalen, Germany, and died May 01, 1874 in Lutzenkirchen, Nordrhein-Westfalen, Germany. i. Anton Wilhelm14 Braun, b. Sep 03, 1839, Schlebusch, Rheinland, Germany; d. Jul 30, 1870, Soldier, found dead. ii. Vinzens Josef Gustav Braun, b. Dec 09, 1840, Schlebusch, Rheinland, Germany. iii. Theodor Hermann Braun, b. Oct 14, 1842, Schlebusch, Rheinland, Germany. iv. Gottfried Gustav Braun, b. May 15, 1844, Schlebusch, Rheinland, Germany; m. Metternick Friedericia, Feb 08, 1872; b. Sep 27, 1841, Lenz, Nordrhein-Westfalen, Germany. v. Hubert Braun, b. Nov 03, 1845, Schlebusch, Rheinland, Germany; d. Apr 08, 1850, Schlebusch, Rheinland, Germany. vi. Friederike Klara Petronella Braun, b. May 14, 1848, Schlebusch, Rheinland, Germany; m. Gottfried Becker, Aug 10, 1875, Schlebusch, Nordrhein-Westfalen, Germany; b. Nov 22, 1847.
vii. Anna Klara Braun, b. Nov 05, 1849, Schlebusch, Rheinland, Germany; d. May 13, 1851, Schlebusch, Rheinland, Germany. viii. Hermann Braun, b. Aug 01, 1851, Schlebusch, Rheinland, Germany; d. 1929, Aachen, Nordrhein-Westfalen, Germany. 18. Eleonora Johanna13 von Zuccalmaglio (Maximilian Friedrich August12 von Zuccalmaglio, Marian Henricus11, Antonio Simeon10, Angelo9 de Zuccalmaglio, Antonio8, Angelo7, Giacomo6, Giovanni5, Bortolamio4, Bernardino3, Tommaso2, Clemente1) was born Apr 26, 1830 Birth Record in Siegburg, Rheinland, Preussen, and died Abt. Mar 03, 1891 in Beuel, Germany. She married Theodor Wilhelm HOENER Jul 03, 1849 in Vilich, Rheinland, Preussen, son of Johann Christoph Hoener and Anna Maria DUBBELMANN. He was born Jul 07, 1822 Birth Record in Deutz, Germany, and died Apr 18, 1895 in Beuel, Germany. iii. Maria Franziska Hoener, b. Apr 15, 1853, Birth Record Schwarz/Rheindorf, Vilich, now Bonn-Beuel, Germany; d. Mar 13, 1913, Bonn, Germany; m. Joseph Huesgen. Maria and Joseph had no children. It was said their castle was taken over by the Germans. I have no further details other than the castle name started with a C. She was christened about Apr 15 - 16, 1853, Vilich, Rheinland, Preussen. They lived in Bonn, Germany. iv. Hermann Carl Hoener, b. Dec 11, 1854, Birth Record Schwarz/Rheindorf, Vilich, now Bonn-Beuel, Germany, d. Dec. 19, 1854 in Beuel, Germany. 21. v. Johanna Henrietta Hoener, b. Nov 18, 1855, Birth Record Schwarz/Rheindorf, Vilich, now Bonn-Beuel, Germany; d. Dec 1927, Arnheim, Holland, m. Johann Heinrich Kemme. 22. vi. Gertrude Hoener, b. Jul 07, 1857, Birth Record Schwarz/Rheindorf, Vilich, now Bonn-Beuel, Germany; d. Aug 04, 1932, Euskirchen, Germany, m. Franz Vierkotten. vii. Theodora Johanna Hoener, b. Nov 10, 1858, Schwarz/Rheindorf, Vilich, now Bonn-Beuel, Germany. viii. Adelheid Henriette Hoener, b. Oct 23, 1860, Birth Record in Schwarz/Rheindorf, Vilich, now Bonn-Beuel, Germany; d. Jul 25, 1925, Beuel, Germany. ix. Dorothea Hoener, b. 1861, Beuel, Germany; d. Jan 1933, Koeln, Germany; m. (1) Unknown; m. (2) Walter Busch. x. Joseph Emil Hoener, b. Apr 06, 1862, Birth Record Schwarz/Rheindorf, Vilich, now Bonn-Beuel, Germany. 23. xi. Helena Elizabeth Hoener, b. Dec 14, 1864, Schwarz/Rheindorf, Vilich, now Bonn-Beuel, Germany; d. Sep 11, 1936, NY, m. Franciscus Guilelmus Oelgarth. 24. xii. Maria Catharina Wilhelmine Hoener, b. Nov 02, 1866, Schwarz/Rheindorf, Vilich, now Bonn-Beuel, Germany; d. Jan 14, 1909, Schwarz/Rheindorf, Germany, m. Peter Broel. 18a. Johanna Marianna von Zuccalmaglio, (Maximilian Friedrich August12 von Zuccalmaglio, Marian Henricus11, Antonio Simeon10, Angelo9 de Zuccalmaglio, Antonio8, Angelo7, Giacomo6, Giovanni5, Bortolamio4, Bernardino3, Tommaso2, Clemente1) was born Dec 10, 1806 Birth Record in Siegburg, Rheinland, Preussen. She married Jan 15, 1857 Joseph Hoener, the son of Johann Christoph Hoener and Anna Maria Dubbelmann. He was born Jun 18, 1833 in Deutz, Germany. i. Anna Maria Mathilde Hoener, b. Dec. 12, 1869 Schwartz-Rheindorf, Vilich now Bonn-Beuel, Germany. 19. Friedrich Wilhelm Franz Joseph13 von Zuccalmaglio (Ferdinand Joseph Maria12, Marian Henricus11, Antonio Simeon10, Angelo9 de Zuccalmaglio, Antonio8, Angelo7, Giacomo6, Giovanni5, Bortolamio4, Bernardino3, Tommaso2, Clemente1) was born Oct 05, 1829 in Graach, Mosel, Rheinland-Pfalz, Germany, and died Dec 29, 1893 in Mannheim, Baden-Wurttemberg, Germany. He married Adelheid Stein. She was born 1835.
i. Max Heinrich Otto Maria14 von Zuccalmaglio, b. 1869, Krefeld, Nordrhein-Westfalen, Germany; d. 1869, Krefeld, Nordrhein-Westfalen, Germany. ii. Maria Valeria von Zuccalmaglio, b. 1870, Krefeld, Nordrhein-Westfalen, Germany; d. 1963, Carlsberg?, Pfalz, Germany. 25. iii. Heinrich Ferdinand Maria von Zuccalmaglio, b. Mar 24, 1872, Krefeld, Nordrhein-Westfalen, Germany; d. Jul 13, 1952, Neckargemund, Baden-Wurttemberg, Germany. iv. Adele Mathilde Maria von Zuccalmaglio, b. 1873, Krefeld, Nordrhein-Westfalen, Germany; d. 1953, Bonn, Nordrhein-Westfalen, Germany. v. Bertha Clara Maria von Zuccalmaglio, b. 1875, Krefeld, Nordrhein-Westfalen, Germany; d. 1956.
vi. Heinrich Maria von Zuccalmaglio, b. 1876, Krefeld?, Nordrhein-Westfalen, Germany; d. 1958, Osorio, Brazil. vii. Anna Gertrud von Zuccalmaglio, b. 1877; d. 1960, Hamburg, Schleswig-Holstein, Germany. viii. Oskar von Zuccalmaglio, b. 1882, Aachen, Nordrhein-Wesfalen, Germany; d. 1902.
i. Marie O15 Hoener, b. Jun 05, 1879, Germany; d. Mar 04, 1975, Erie, Erie Co, Pennsylvania; m. Rolland Hugh Humphrey, Jr, Aft. Nov 24, 1904, New York; b. Dec 13, 1883, Jamestown, Chautauqua, New York; d. Jul 13, 1960, Erie, Erie Co, Pennsylvania. iii. Margaret15 Hoener, b. Abt. 1889, Buffalo, Erie Co, New York; d. Abt. 1893, Buffalo, Erie Co, New York. 26. iv. Albert Lewis Hoener, b. Sep 23, 1890, Buffalo, Erie Co, New York; d. Sep 23, 1957, Grosse Pointe, Wayne Co, Michigan. 27. v. Edward Louis Hoener, b. Jun 23, 1893, Lackawanna, Erie Co, New York; d. Nov 08, 1966, Monroe, Monroe Co, Michigan. 28. vi. Margaret Amelia Hoener, b. Sep 30, 1894, Buffalo, Erie Co, New York; d. Jun 25, 1978, Lansing, Ingham Co, Michigan. 29. vii. William C Hoener, b. Feb 15, 1896, Buffalo, Erie Co, New York; d. Jan 21, 1984, Grand Beach, Monroe Co, Michigan. viii. Joseph Hoener I, b. Bef. 1902, Buffalo, Erie Co, New York; d. Bef. 1903, Buffalo, Erie Co, New York. ix. Joseph Hoener, II, b. Bef. 1902, Buffalo, Erie Co, New York; d. Bef. 1903, Buffalo, Erie Co, New York. x. Elsie Hoener, b. Bef. 1902, Buffalo, Erie Co, New York; d. Bef. 1903, Buffalo, Erie Co, New York. 30. xi. Elsie Florence Hoener, b. Jan 28, 1903, Buffalo, Erie Co, New York; d. Nov 18, 1991, Southfield, Oakland Co, Michigan. 21. Johanna Henrietta14 Hoener (Eleonora Johanna13 von Zuccalmaglio, Maximilian Friedrich August12 von Zuccalmaglio, Marian Henricus11, Antonio Simeon10, Angelo9 de Zuccalmaglio, Antonio8, Angelo7, Giacomo6, Giovanni5, Bortolamio4, Bernardino3, Tommaso2, Clemente1) was born Nov 18, 1855 in Vilich, Rheinland, Preussen, and died Dec 1927 in Arnheim, Holland. She married Johann Heinrich Kemme. He was born Oct 11, 1850 in Fuerstenau, Germany, and died in Fuerstenau, Germany. 31. i. Johann Heinrich15 Kemme, b. Arnheim, Holland. 22. Gertrude14 Hoener (Eleonora Johanna13 von Zuccalmaglio, Maximilian Friedrich August12 von Zuccalmaglio, Marian Henricus11, Antonio Simeon10, Angelo9 de Zuccalmaglio, Antonio8, Angelo7, Giacomo6, Giovanni5, Bortolamio4, Bernardino3, Tommaso2, Clemente1) was born Jul 07, 1857 in Vilich, Rheinland, Preussen, and died Aug 04, 1932 in Euskirchen, Nordrhein-Westfalen, Germany. She married Franz Vierkotten Jul 07, 1881. He was born Apr 07, 1855 in Honnef, Nordrhein-Westfalen, Germany, and died Feb 08, 1906 in Euskirchen, Nordrhein-Westfalen, Germany. He was a Counsellor of Justice. i. Elizabeth15 Vierkotten, b. Nov 16, 1882, Beuel, Nordrhein-Westfalen, Germany; d. Oct 28, 1920; m. Theodor Proempeler, Oct 28, 1920; b. Abt. Aug 17, 1884, Mannheim/Rhein, Nordrhein-Westfalen, Germany. ii. Johanna Vierkotten, b. Jan 04, 1884, Beuel, Nordrhein-Westfalen, Germany; m. Hermann Lenzen, May 1919; b. 1885, Euskirchen, Nordrhein-Westfalen, Germany. iii. Hugo Vierkotten, b. May 10, 1886, Beuel, Nordrhein-Westfalen, Germany; d. Aug 31, 1914, Montgon, France. iv. Franz Vierkotten, b. Euskirchen, Nordrhein-Westfalen, Germany; d. Euskirchen, Nordrhein-Westfalen, Germany. v. Anna Maria Vierkotten, b. Oct 02, 1892, Euskirchen, Nordrhein-Westfalen, Germany. 32. vi. Franz Theodor Vierkotten, b. Aug 10, 1894, Euskirchen, Nordrhein-Westfalen, Germany. vii. Gertrude Vierkotten, b. Nov 03, 1902, Euskirchen, Nordrhein-Westfalen, Germany. viii. Helene Vierkotten, b. Nov 03, 1902, Euskirchen, Nordrhein-Westfalen, Germany; d. Aug 1903, Euskirchen, Nordrhein-Westfalen, Germany. 23. Helena Elizabeth14 Hoener (Eleonora Johanna13 von Zuccalmaglio, Maximilian Friedrich August12 von Zuccalmaglio, Marian Henricus11, Antonio Simeon10, Angelo9 de Zuccalmaglio, Antonio8, Angelo7, Giacomo6, Giovanni5, Bortolamio4, Bernardino3, Tommaso2, Clemente1) was born Dec 14, 1865 in Vilich, Rheinland, Preussen, and died Sep 11, 1936 in New York. She married Franciscus Guilelmus Oelgarth. He was born Bet. Dec 11 - 16, 1860 in Maria-Himmelfahrt Roemisch-Katholische, Andernach, Rheinland, Preussen, and died Aug 15, 1919 in Bad Ems, Germany. i. Elfriede15 Oelgarth, b. 1898; d. 1919. 33. ii. Hildegard Oelgarth, b. 1900, Koeln, Germany. 24. Maria Catharina Wilhelmine14 Hoener (Eleonora Johanna13 von Zuccalmaglio, Maximilian Friedrich August12 von Zuccalmaglio, Marian Henricus11, Antonio Simeon10, Angelo9 de Zuccalmaglio, Antonio8, Angelo7, Giacomo6, Giovanni5, Bortolamio4, Bernardino3, Tommaso2, Clemente1) was born Nov 02, 1866 in Beuel, Germany, and died Jan 14, 1909 in Schwarz/Rheindorf, Germany. She married Peter Broel. He was born Abt. 1854 in Vilich, Rheinland, Preussen. At some time, maybe after Wilhelmine died in 1866, at 40, Peter Broel lived in Buffalo, New York. i. Eleonor15 Broel, b. Abt. 1891.
ii. Theodor Broel, b. Oct 08, 1889, Bonn, Germany; d. Dec 1969, Rochester, Monroe Co, NY. iii. Maria Broel, b. Feb 11, 1893; d. Oct 1972, Buffalo, Erie Co, New York. iv. Alexander Broel, b. Feb 25, 1901, Bonn, Germany; d. Oct 1975, Florida. 25. Heinrich Ferdinand Maria14 von Zuccalmaglio (Friedrich Wilhelm Franz Joseph13, Ferdinand Joseph Maria12, Marian Henricus11, Antonio Simeon10, Angelo9 de Zuccalmaglio, Antonio8, Angelo7, Giacomo6, Giovanni5, Bortolamio4, Bernardino3, Tommaso2, Clemente1) was born Mar 24, 1872 in Krefeld, Nordrhein-Westfalen, Germany, and died Jul 13, 1952 in Neckargemund, Baden-Wurttemberg, Germany. He married Unknown. 34. i. Margarete15 von Zuccalmaglio, b. 1902, Mannheim, Baden-Wurttemberg, Germany; d. 1992, Frankfurt, Germany. ii. Karl Heinrich Maria von Zuccalmaglio, b. 1907, Mannheim, Baden-Wurttemberg, Germany; d. 1993, Rheinfelden, Baden-Wurttemberg, Germany. 26. Albert Lewis15 Hoener (Albert Eduard14, Eleonora Johanna13 von Zuccalmaglio, Maximilian Friedrich August12 von Zuccalmaglio, Marian Henricus11, Antonio Simeon10, Angelo9 de Zuccalmaglio, Antonio8, Angelo7, Giacomo6, Giovanni5, Bortolamio4, Bernardino3, Tommaso2, Clemente1) was born Sep 23, 1890 in Buffalo, Erie Co, New York, and died Sep 23, 1957 in Grosse Pointe, Wayne Co, Michigan. He married Margaret 'Zoe' Lorene Fellabaum Jun 25, 1913. She was born Jul 17, 1892 in Detroit, Wayne Co, Michigan, and died Feb 10, 1976 in Detroit, Wayne Co, Michigan. i. Dorothy Margaret16 Hoener, b. Mar 18, 1914, Detroit, Wayne Co, Michigan; m. William Patrick Connolly; b. Nov 15, 1910, Dubuque, Dubuque Co, Iowa; d. May 12, 1981, Grosse Pointe Park, Wayne Co, Michigan. ii. Miriam Christian Hoener, b. Aug 06, 1915, Detroit, Wayne Co, Michigan; d. Feb 27, 2001, Grand Junction, Colorado; m. Joseph Treble Sinclair, 1936; b. May 1915; d. Bef. 1997. 27. Edward Louis15 Hoener (Albert Eduard14, Eleonora Johanna13 von Zuccalmaglio, Maximilian Friedrich August12 von Zuccalmaglio, Marian Henricus11, Antonio Simeon10, Angelo9 de Zuccalmaglio, Antonio8, Angelo7, Giacomo6, Giovanni5, Bortolamio4, Bernardino3, Tommaso2, Clemente1) Another was born Jun 23, 1893 in Lackawanna, Erie Co, New York, and died Nov 08, 1966 His Obit He married "Sadie" K Kelsey Oct 30, 1915 in Cass City, Tuscola Co, Michigan. She was born Feb 14, 1894, in Cass City, Tuscola Co, Michigan, and died Sep 26, 1977 in Monroe, Monroe Co, Michigan. i. Virginia16 Hoener, b. Oct 03, 1916; d. Feb 08, 1965, Michigan; m. Raymond O Williams; b. 1907; d. Jul 10, 1974, Michigan. ii. Earle Kelsey Hoener, b. Feb 06, 1919, Detroit, Wayne Co, Michigan; d. Apr 07, 1978, Lathrup Village, Oakland Co, Michigan; m. Helen Elizabeth Kelly, May 25, 1940, Detroit, Wayne Co, Michigan; b. Jan 12, 1916; d. Aug 24, 1984, Lathrup Village, Oakland Co, Michigan. 28. Margaret Amelia15 Hoener Another Another (Albert Eduard14, Eleonora Johanna13 von Zuccalmaglio, Maximilian Friedrich August12 von Zuccalmaglio, Marian Henricus11, Antonio Simeon10, Angelo9 de Zuccalmaglio, Antonio8, Angelo7, Giacomo6, Giovanni5, Bortolamio4, Bernardino3, Tommaso2, Clemente1) was born Sep 30, 1894 in Buffalo, Erie Co, New York, and died Jun 25, 1978 in Lansing, Ingham Co, Michigan. At some time, she met (1) John Daniel PROSCH in Detroit, Wayne Co, MI, son of John Daniel Prosch and Mary Katherine Krug. He was born Oct 17, 1890 in Logansport, Cass Co, IN, and died Aug 29, 1968 in Royal Oak, Oakland Co, MI. She married (2) Leo CONDON possibly in 1918, although she states she was first married when she was 18 years old, on the 1930 census. Later she married (3) Edward H. Lynes possibly about 1929. He was born about 1882 in OH. He was first married to Norna B or F Brown b. 1883 in MI and died Nov 05, 1981 in Saginaw, MI. Edward and Norna had 3 sons, all born in Michigan: 1. Edward H. LYNES b. abt 1911; 2. Benjamin Charles LYNES b. Mar 12, 1913 and died Oct 19, 1993 in Saginaw, MI; 3. Richard Thomas LYNES b. Oct 15, 1916 and died Jul 20, 1998 in Saginaw, MI. Benjamin's wife was Mary E. UNKNOWN b. Mar 01, 1917 in MI and died Oct 25, 1999 in Saginaw, MI. Richard married Dora M. UNKNOWN b. Jan 29, 1923 and died Dec 09, 1988 in Saginaw, MI. i. Robert Albert16 Condon, b. Aug 15, 1919, Detroit, Wayne Co, Michigan; d. Jul 17, 1986, Lansing, Ingham Co, Michigan; m. Joseille Sargent, Mar 14, 1941, Lansing, Ingham Co, Michigan; b. Sep 15, 1921, Ann Arbor, Washtenaw Co, Michigan. ii. Mary Louise Joanne16 Lynes, b. Dec 08, 1929, Detroit, Wayne Co, Michigan; m. Dale Franklin Battley, Aug 01, 1953, East Lansing, Ingham Co, Michigan; b. Nov 19, 1929, Lansing, Ingham Co, Michigan. 29. William C15 Hoener (Albert Eduard14, Eleonora Johanna13 von Zuccalmaglio, Maximilian Friedrich August12 von Zuccalmaglio, Marian Henricus11, Antonio Simeon10, Angelo9 de Zuccalmaglio, Antonio8, Angelo7, Giacomo6, Giovanni5, Bortolamio4, Bernardino3, Tommaso2, Clemente1) was born Feb 15, 1896 in Buffalo, Erie Co, New York, and died Jan 21, 1984 His Obit in Grand Beach, Monroe Co, Michigan. He married (1) Isabelle Cohen. He married (2) Frances Lorene Crites Sep 15, 1927 in Detroit, Wayne Co, Michigan. She was born Feb 11, 1907, and died Oct 03, 1994 in Frenchtown, Monroe Co, Michigan. i. William16 Hoener, Jr., b. Abt. 1930; d. Abt. 1931, Michigan. ii. Barbara Lee Hoener, b. Jan 17, 1932, Monroe, Monroe Co, Michigan; d. Jun 1985, Michigan; m. Clifford Allen. 30. Elsie Florence15 Hoener (Albert Eduard14, Eleonora Johanna13 von Zuccalmaglio, Maximilian Friedrich August12 von Zuccalmaglio, Marian Henricus11, Antonio Simeon10, Angelo9 de Zuccalmaglio, Antonio8, Angelo7, Giacomo6, Giovanni5, Bortolamio4, Bernardino3, Tommaso2, Clemente1) was born Jan 28, 1903 in Buffalo, Erie Co, New York, and died Nov 18, 1991 in Southfield, Oakland Co, Michigan. She married Dale Louis Prentice Oct 20, 1928, son of Harry Prentice and Marie Unknown. He was born Jun 22, 1901 in Possibly Terre Haute, Indiana, and died Apr 14, 1954 in Detroit, Wayne Co, Michigan. i. Dale Louis16 Prentice, Jr., b. 1930, Detroit, Wayne Co, Michigan; m. Margaret Mary Fellrath. 31. Johann Heinrich15 Kemme (Johanna Henrietta S14 Hoener, Eleonora Johanna13 von Zuccalmaglio, Maximilian Friedrich August12 von Zuccalmaglio, Marian Henricus11, Antonio Simeon10, Angelo9 de Zuccalmaglio, Antonio8, Angelo7, Giacomo6, Giovanni5, Bortolamio4, Bernardino3, Tommaso2, Clemente1) was born in Arnheim, Holland. He married Eddie Von Domselem. i. Bentie16 Kemme, b. Abt. 1925.
ii. Hannie Kemme, b. Abt. 1926. 32. Franz Theodor15 Vierkotten (Gertrude14 Hoener, Eleonora Johanna13 von Zuccalmaglio, Maximilian Friedrich August12 von Zuccalmaglio, Marian Henricus11, Antonio Simeon10, Angelo9 de Zuccalmaglio, Antonio8, Angelo7, Giacomo6, Giovanni5, Bortolamio4, Bernardino3, Tommaso2, Clemente1) was born Aug 10, 1894 in Euskirchen, Nordrhein-Westfalen, Germany. He married Margarethe Scheurer Aug 05, 1927. She was born Feb 16, 1895 in Falkenlust, Germany. i. Gertrudie16 Vierkotten, b. Jun 13, 1928. 33. Hildegard15 Oelgarth (Helena Elizabeth14 Hoener, Eleonora Johanna13 von Zuccalmaglio, Maximilian Friedrich August12 von Zuccalmaglio, Marian Henricus11, Antonio Simeon10, Angelo9 de Zuccalmaglio, Antonio8, Angelo7, Giacomo6, Giovanni5, Bortolamio4, Bernardino3, Tommaso2, Clemente1) was born 1900 in Koeln, Germany. She married Wilhelm Zuendt 1921. He was born 1895 in Koeln, Germany. i. Helga16 Zuendt, b. 1925.
ii. Norman Zuendt, b. 1930. 34. Margarete15 von Zuccalmaglio (Heinrich Ferdinand Maria14, Friedrich Wilhelm Franz Joseph13, Ferdinand Joseph Maria12, Marian Henricus11, Antonio Simeon10, Angelo9 de Zuccalmaglio, Antonio8, Angelo7, Giacomo6, Giovanni5, Bortolamio4, Bernardino3, Tommaso2, Clemente1) was born 1902 in Mannheim, Baden-Wurttemberg, Germany, and died 1992 in Frankfurt, Germany. She married Unknown. i. Maria Rita16 Unknown, b. 1937, Berlin-Dahlen, Germany; d. 1987, Maur, Schweiz, Germany; m. Unknown. ii. Reinhard Maria Unknown, b. 1939, Heidelberg, Germany. iii. Angelika Maria Elisabeth Hulda Unknown, b. 1941, Lorrach, Baden-Wurttemberg, Germany.